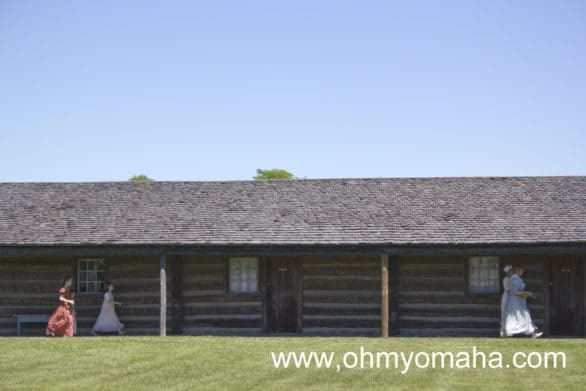 Fort Atkinson is a Nebraska State Historical Park in Fort Calhoun, which is a short drive north of Omaha. 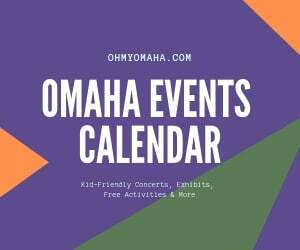 Considering how close it is to Omaha, it’s been a major oversight that I’ve never visited, especially since there are monthly events that are incredibly interesting for families. Mooch learns a little sewing technique from a seamstress during a living history weekend event at Fort Atkinson in Nebraska. You can visit any time of year to explore the fort, but for I cannot recommend enough that you try to time a visit for a historical re-enactment. Actresses walking along the north side of Fort Atkinson, located in Fort Calhoun, Nebraska. I never thought of myself as being into re-enactments, but my opinion has evolved, especially after attending the June historic re-enactment of fort life in the 1820s at Fort Atkinson. I was impressed and could not believe more people don’t know about it. 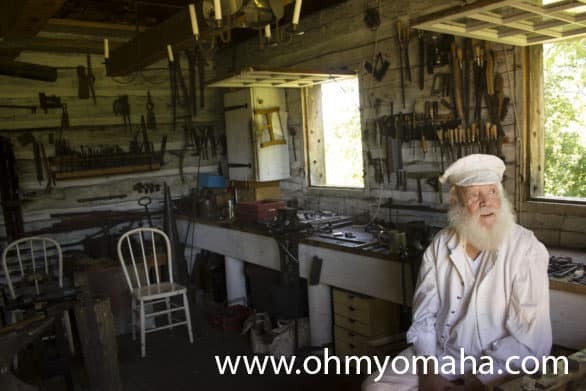 Don’t miss the blacksmith during the re-enactment weekends at Fort Atkinson, located in Fort Calhoun, Nebraska. 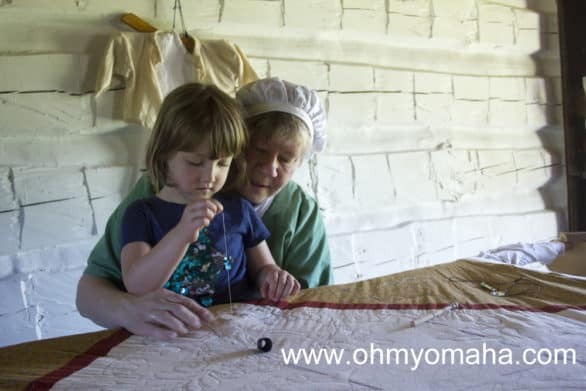 On the first Saturday and Sunday of the month, May through October, Friends of Fort Atkinson recreate life 200 years ago. Their attention to detail and characters they create is great, and made the whole experience fascinating. 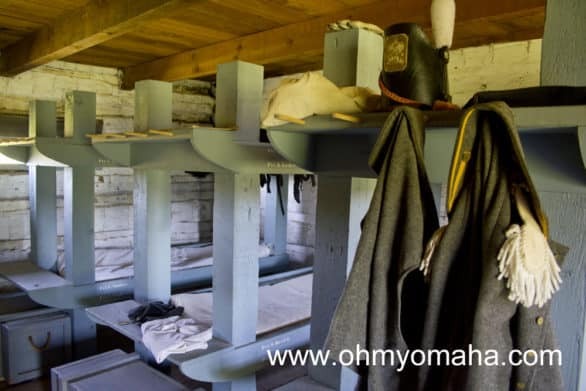 A peek inside one of the rooms at Fort Atkinson. Rooms throughout the fort are recreated with the typical items of the time and characters describing what their life would’ve been like. One of the first rooms you’ll likely enter when you first get there is the Colonel’s office. The blacksmith shop looked as real as it gets. You could also watch ladies weave, men make barrels or talk to soldiers getting ready for battle. And for the serious history buffs, it was acknowledged that there wouldn’t be any women found inside the fort back in its hay day. The actresses explained why that some recreations were done just to give a better idea of life at the time – whether it was cooking, sewing or selling goods. Ladies in the kitchen at Fort Atkinson. They’ll be the first to tell visitors women weren’t allowed in the fort back in the day, though. They’re part of the re-enactments to give insight to what life was like outside of the fort. When you arrive at the fort, stop at the info table to grab a scavenger hunt. 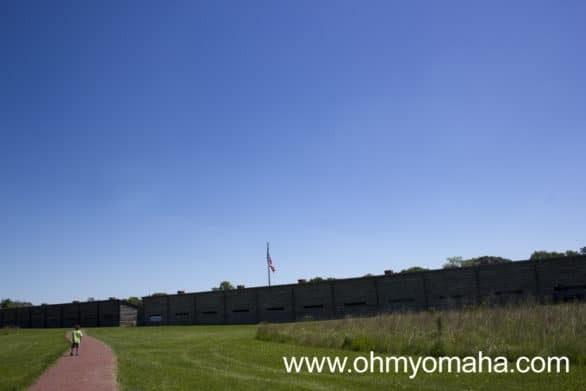 The outside of Fort Atkinson doesn’t really indicate much of what’s waiting for your family inside, does it? Kids need to ask the re-enactors questions in order to successfully finish the hunt. This provides shy kids with talking points to interact with the actors. It was a handy way to learn about things you wouldn’t think to ask about. 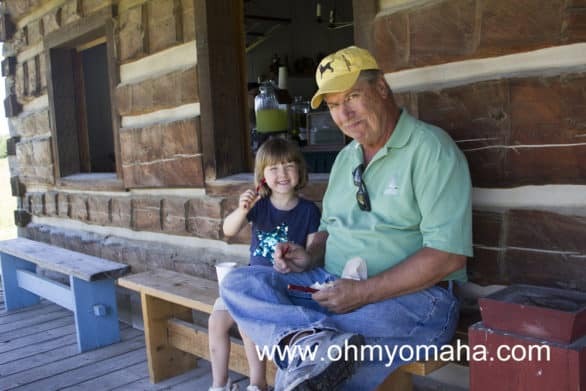 Kids can take their finished scavenger hunt to the general store and receive a free piece of rock candy. 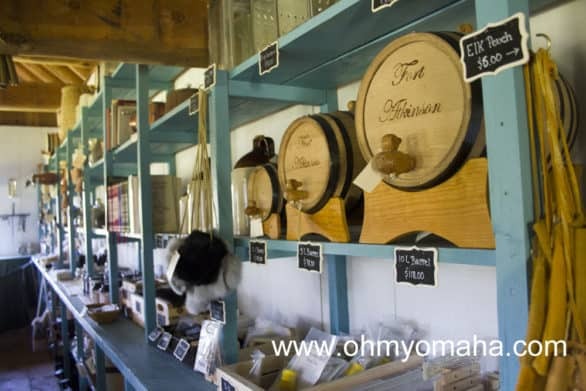 The general store at Fort Atkinson is a working store where you can buy gifts, treats and, apparently, barrels. Speaking of that store, this is another kid-favorite if only because they have candy, lemonade and toys. Good luck leaving it without a treat. Mooch and my dad enjoying an afternoon snack and lemonade on the porch of the general store. You don’t have to do the scavenger hunt, of course. We didn’t. The kids still found ways to interact, helping sew a quilt and trying on the colonel’s hat, for instance. One thing to note: They fire a cannon during the re-enactments. Some kids are going to love the loud boom and others won’t (cover their ears regardless). My kids were not fans. The cannon is prepped to be fired at Fort Atkinson. 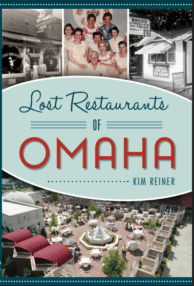 Where: 201 S. Seventh St., Fort Calhoun, Neb. When: First Saturday and Sunday of the month May through October. The first weekend in July has a focus on the Fourth of July and the Declaration of Independence will be read aloud. Park is open year-round 8 a.m. to 5 p.m. Visitor Center is open Monday through Friday from Memorial Day weekend through Labor Day from 10 a.m. to 5 p.m. Cost: Valid state park permit is required. Visitor Center is $2 for adults, $1 for children under 13, and FREE for children under 3. I know you guys will enjoy it!